Well I have been busy at work and trying to come up with some ideas for the upcoming National Telecommunications Week. I can't go into detail here because people from work read this from time to time LOL. If you are still unsure, check out Yahoo Groups Make the Cut, MTC-Hints and Tips or MTC_Tuts. You can meet great people at any of these sites and learn a ton about the software. I have finally had a moment to make my Grandson Mason his Easter card. Now I need to get them in the mail. 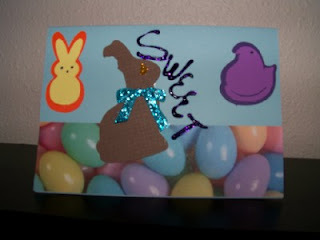 The "peeps" on this card are from Melanie at Mommymelsaddiction the chocolate bunny is from the Easter Solutions cart. Inside it says "That's what you are to me! HAPPY EASTER"